Worst cupcake ever!!!!!!!! My girlfriend spit it out after one lick. It had salt around in the frosting YUCK!!!! Oh, how disappointing! I love a good cupcake, but this was terrible. The only thing that made this cupcake a "Margarita" cupcake was that there was some green salt sprinkled on top of the icing. And that icing was abysmal - flavorless sugar fluff that you could find in a supermarket bakery. The cake itself also seemed pre-packaged and lifeless, with no lime flavor to make it seem Margarita-ish. To top it all off, the high price tag was obscene. I will not be stopping at this truck again, no matter how strong my sweet tooth. 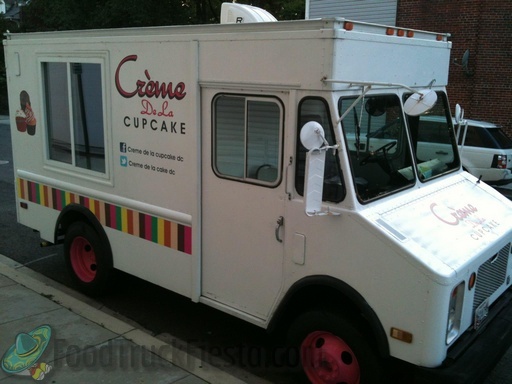 Creme de la Cupcake food truck serves the freshest gourmet cupcakes daily and is available for catering.